Access from the railway station – Toruń Główny Use buses 22 and 27. Go past the bridge and get off the bus on the second bus stop. Go under the Łukami Cezara and go down Szeroka Street. Turn left after 500 m into Małe Garbary Street. Carry on 70 m and the hostel is on your right you can’t miss it! Access from the bus station Go straight Uniwersytecka Street toward the old town. Cross the traffic lights and carry on Dominikańska Street for around 100 m toward Małe Garbary Street. 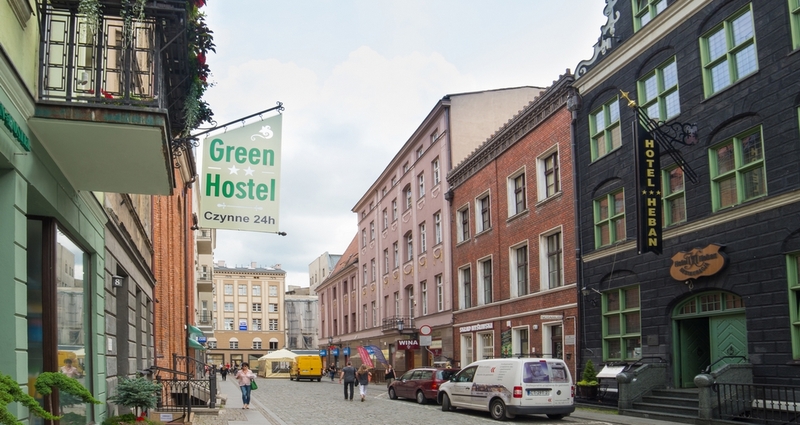 Go down Małe Garbary Street for 200 m.
Car Access to the hostel isn’t possible due to traffic restriction around the old town. It’s possible to park the car on the way if there is any free parking room within 75m from the hostel. The car park is free of charge between 18pm-6am (Monday –Friday) including Saturday, Sunday and holidays. From 8am-18pm the car park is charged according to the parking meter.